Attempting to understand the emotional lives of dogs has been a hot topic of scientific study for centuries. In the 1600s, the French philosopher, Rene Descartes compared animals to living machines, incapable of feeling pain or emotion. Thankfully, science has progressed a long way since the 1600s. These advances have allowed us to delve deeper into the mystery of canine consciousness. We now know that dogs possess all the same complex brain structures humans do – including those responsible for emotion. Their minds undergo the same chemical changes and are flooded with the same hormones as our own during emotional states – including oxytocin, which is involved in feelings of love and attachment. Dr. Stanley Coren, Professor Emeritus in the Department of Psychology at the University of British Columbia, is the author of more than a dozen books on the subject of dogs. He estimates their emotional maturity as equivalent to that of the average 2 1/2-year-old child. 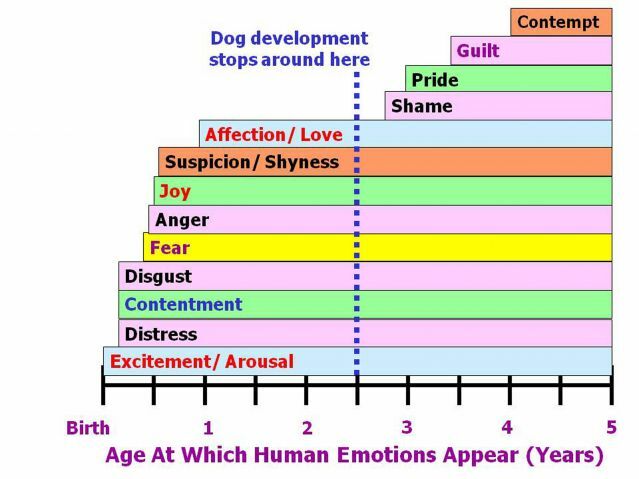 As you can see from the chart below, dogs experience many of the same emotions as young children, but never progress to the more complex feelings of shame, pride, guilt or contempt. 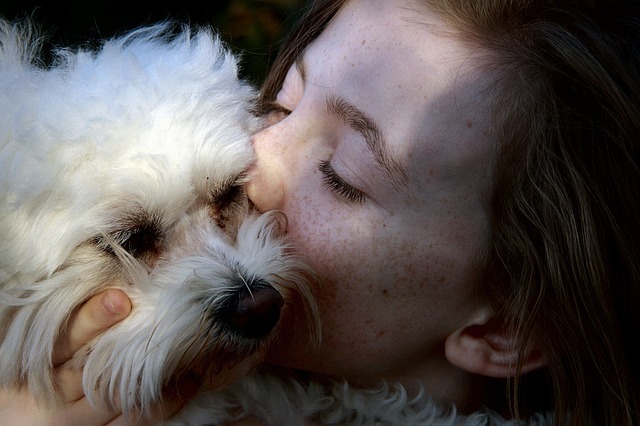 These emotions develop later in a child’s life and require elements of learning that researchers do not currently believe dogs are capable of. Now that we have covered the basics, let’s explore some of the commonly asked questions on the subject of canine emotion. 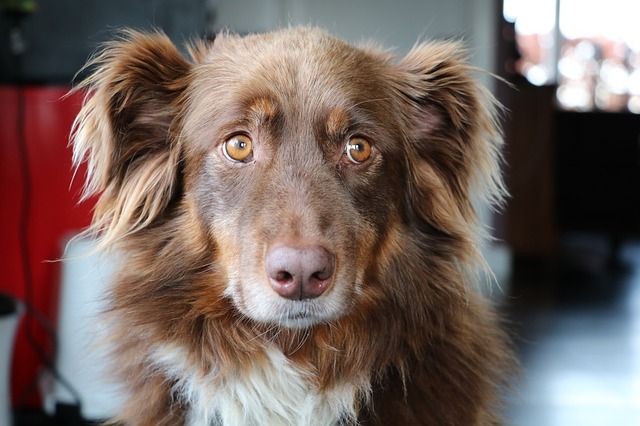 Can dogs understand and process human emotions? A 2016 study conducted by animal behavior experts and psychologists from the universities of Lincoln and Sao Paulo showed that dogs not only recognize the visual cues of human emotions, they can also hear the difference between joy and anguish in our voices. The general consensus among animal scientists is that our dogs do love us – and they have gathered quite a bit of evidence to prove it. 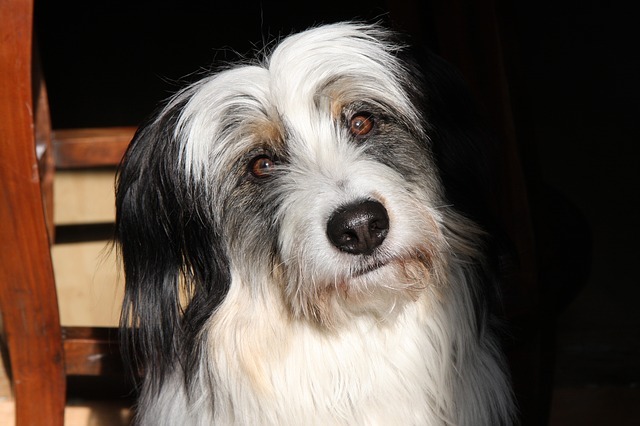 First, there’s the “oxytocin-gaze positive loop” that occurs when dogs look into their humans’ eyes. This is most often utilized by babies and new mothers to cement their bond, but our pups “hijacked” the pathway sometime over the past 10,000 years during our side-by-side evolution. In addition to an increase in oxytocin while looking at their favorite human, the reward center of a dog’s brain also lights up when they catch wind of their owners’ scent. Neuroscientist, Gregory Berns made this discovery in a 2014 study using an fMRI machine. Finally, there are the behavioral signs such as running to their owners for comfort when startled — something other animals rarely do. 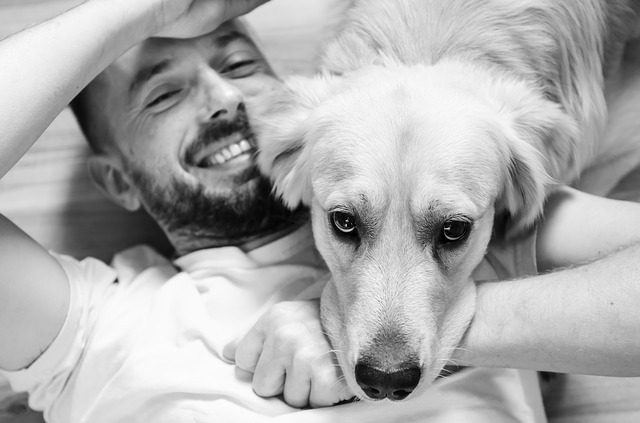 Dogs that sleep with their owners are thought to have accepted them as “pack members.” According to neuroscientist and canine expert, Gregory Berns, this is the ultimate sign of trust since sleep is when they are at their most vulnerable. Also, dogs that lean their bodies against their humans throughout the day are thought to be seeking out affection and reassurance. Some researchers even think it is their way of “hugging” us! 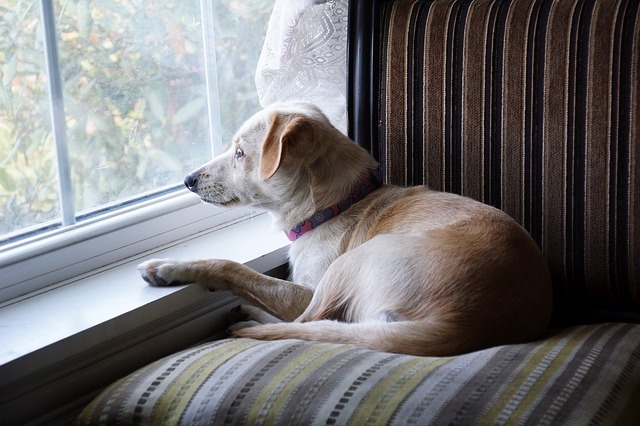 Does your dog miss you when you are away? According to Gregory Berns, the answer is yes. 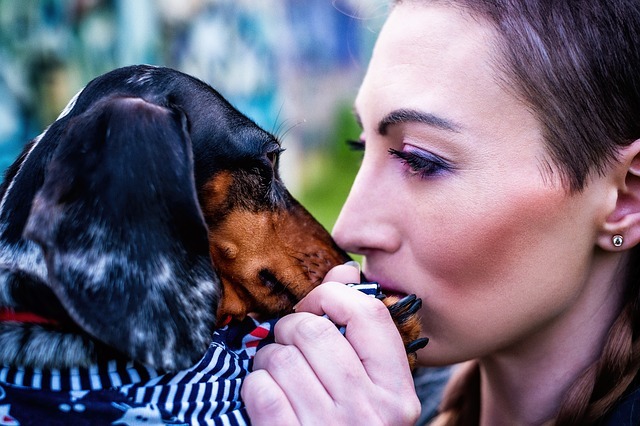 In the same 2014 fMRI study referenced above, he noted that of five human and canine scents, the dogs’ brains showed the greatest response in the caudate nucleus – the reward center of the brain – when they were exposed to their owners’ scents. In other words, the dogs’ brains reacted to the smell of their approaching human in the same way they would for a yummy treat! Another study on their sense of time showed that dogs are far more excited to see their humans after two hours than after 30 minutes. However, there was no significant change in reaction between two and four hours of absence. So while they certainly understand we are gone and rejoice when we return, the extent of their concept of time is unclear. Does your dog think about you when you are gone? Even if you are only gone a matter of hours, your dog is likely thinking about you just as much as you are thinking about them. Does your dog dream about you? 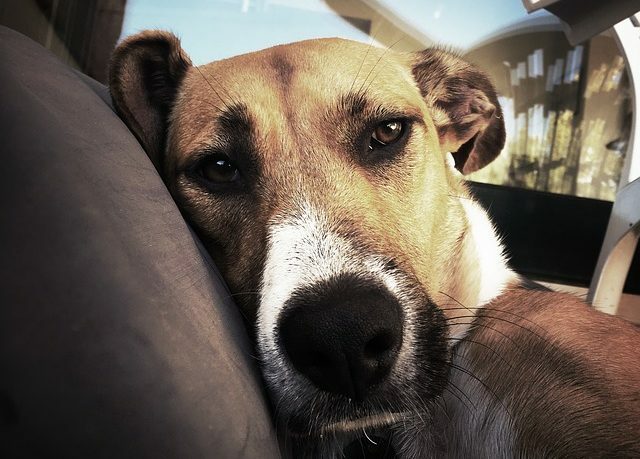 Research shows that dogs have sleep cycles very similar to our own and experience REM (Rapid Eye Movement) sleep, the phase in which dreams occur in humans. 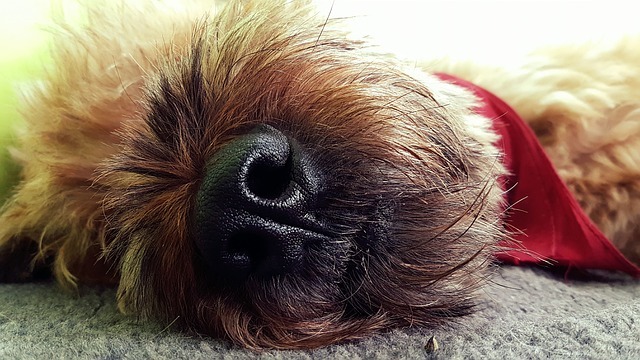 According to Dr. Deirdre Barrett, a Clinical and Evolutionary Psychologist at Harvard University, dogs most likely dream of their favorite thing – their owners! 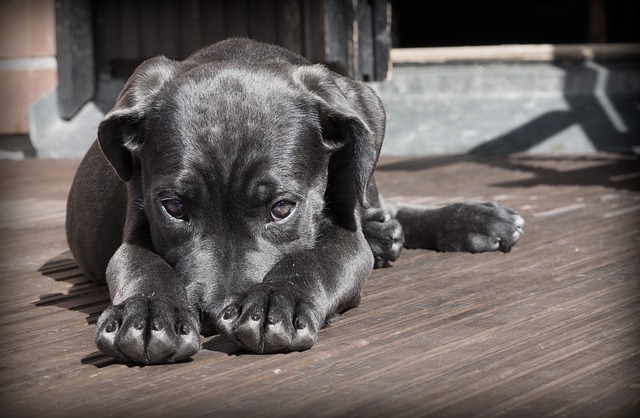 Does your dog feel guilt or shame? Many people argue that their dog displays signs of guilt after tearing up furniture or going to the bathroom indoors. However, Dr. Corden states that what they are really seeing is the more basic emotion of fear. In his opinion, dogs are not capable of experiencing guilt or shame. Instead, they read the signs of disappointment and anger in their humans and react with uneasiness. Does your dog hold a grudge? The jury is still out on this one. Dr. Coren’s chart of canine emotions puts contempt out of the range of canine possibility. However, a 2015 Japanese study published in the journal, Neuroscience and Biobehavioural Reviews, observed that dogs refused to take treats from humans who were unkind to their owners. 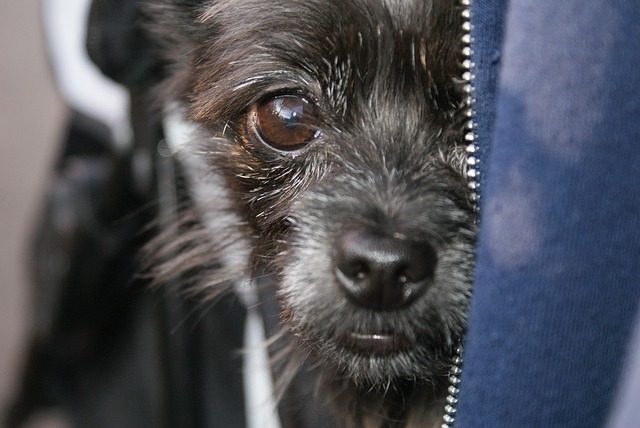 How can you cross the “language barrier” to show your dogs you love them?